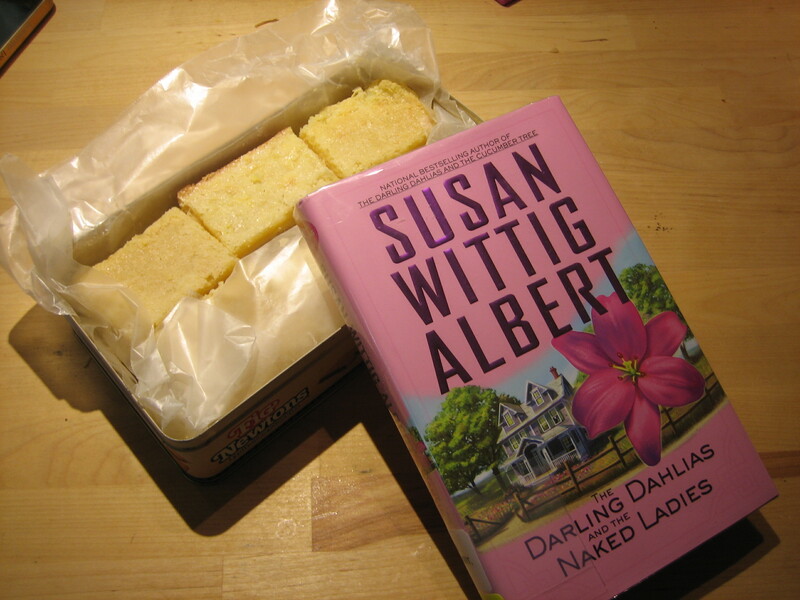 When I was at the beach last month, we stopped in at a bookstore to browse and I discovered that Susan Wittig Albert has started a new mystery series. Albert is one of my favorite mystery authors, and while I know I originally started reading her for her modern China Bayles series, I have since discovered that I appreciate her even more for her historical mysteries. She and her husband co-authored a Victorian/Edwardian mystery series under the pseudonym Robin Paige that were simply amazing, but unfortunately that series was brought to a close because of the sheer amount of research the authors found themselves having to do, because they incorporated new real historical figures of significance into each book. It was that dedication to research that made the books so good, so I understand why they felt the series had to end, but I was still sad. That series did inspire another historical series, this time under Albert’s name, starring Beatrix Potter, who had appeared briefly in one of the Robin Paige books. I’ve enjoyed these, and the insight they offer into Potter’s life while still being fun fiction is lovely, but they didn’t grab me as much as the Paige books. Now, though, Albert has started an entirely new series, this time drawing more on her gardening knowledge, frequently on display in the China Bayles series, but now put in the context of a Depression-era gardening club in the small town of Darling, Alabama, who call themselves the Darling Dahlias. The women of the club are all strong-willed and inquisitive individuals, so if something is happening in town, they’re going to find a way to solve it. I particularly like the president of the club, Lizzy Lacy, who often takes a leading role. Though it’s clear she is entering “old maid” territory to most people, she feels like she is only just discovering how to live her life and refuses to give up her independence. She is the local attorney’s secretary and recently managed to buy her own house, enabling her to finally move away from the smothering embrace of her mother. Her best friend is Verna Tidwell, an opinionated and fiercely inquisitive woman with a passion for detective magazines, who, when widowed after just 5 years of marriage, discovered she wasn’t terribly upset about now finding herself living on her own and now pretty much entirely runs the county clerk’s office while the official clerk is out fishing. Other members of the club include the proprietress of the local diner, who also happens to run the switchboard; the owner of the local beauty parlor; and the woman running the local boarding house for older women of modest means, just to mention a few. They’re all described in such wonderful detail that they feel like real friends, not only to each other, but also to the reader. The back of each book also features period-appropriate household tips and recipes. At first I was skeptical, because this has become such a common feature in any cozy mystery having the tiniest tangential relationship to food, but in these books, they actually manage to feel perfectly tied in. The household tips are from Lizzy Lacy’s gardening column for the local newspaper, and the recipes are all ones mentioned by the club members as ones they’d like to share with each other. Even better, given the Southern Depression-era setting, they’re actually recipes the reader can easily put together with normal kitchen staples, which is how I got inspired to make lemon chess squares last week. Having not made any type of lemon bar from scratch before, I have much more respect for how very unhealthy these things are, which is, of course, why they are so delicious. I’d tell you the recipe, but I had to return the book to the library yesterday, so you’ll just have to read the series for yourself! There have only been two published so far, and I can’t wait for more. Fortunately, the third book should be out in September. I really do highly recommend them. They make me wish I could loan them to my grandmothers and then talk to them about how realistic things seem. I think they both would have like the ladies of the Darling Dahlias. Personally, I find it rather embarrassing to be an American abroad right now. I’m constantly being asked when the US will be attacking Iraq, why our president wants to attack so badly, do all Americans think it is a good idea, how many Americans think this is a good idea (please give percentages), and is it true that most Americans can’t find Japan on a map? Honestly, I do not have some sort of direct secret American connection to the White House, from which I receive my updates on exactly what the president’s latest thoughts are. I didn’t vote for him, I think he’s a moron, and honest to goodness, I’m not kidding, not all Americans are the same. Really. I know it’s hard to believe but it’s true. Also, the US is a very big country, with many, many people in it, and some of them can’t even find their own state on a map, let alone a country on the other side of the globe. I still remember the one class where the teacher wanted to use “Which country will the US be attacking soon?” as a geography question for the mock Jeopardy game we were going to play as warm-up. I tried so hard to convince her that it wasn’t an appropriate question, hoping as hard as I could that it wouldn’t turn out that way. Many customers were lawyers working late; they came down, bleary-eyed, fumbling with wallets and purses. None of them looked at us twice. It would have been a lot for them to process if they had known all the baggage that accompanied their General Tao Chicken. That name was a misspelling of General Tso, or Zuo Tongtang, the brilliant and ruthless Qing general who had expanded the Chinese empire. Under Zuo’s command, in 1884, Xinjiang [the Uighur homeland] had become a Chinese province; and now the Uighurs were delivering his namesake chicken in the American capital. General Tso and Colonel Sanders: great chicken imperialists.